CRISPR/Cas9 is a gene editing technology that is revolutionising the way that scientists design biomedical research. In addition to this, CRISPR/Cas9 is opening promising avenues for applications in gene therapy, manufacturing, and agriculture. The commercial and disruptive potential of this invention is so promising that it sparked a ‘gold rush’ towards patenting CRISPR/Cas technologies. 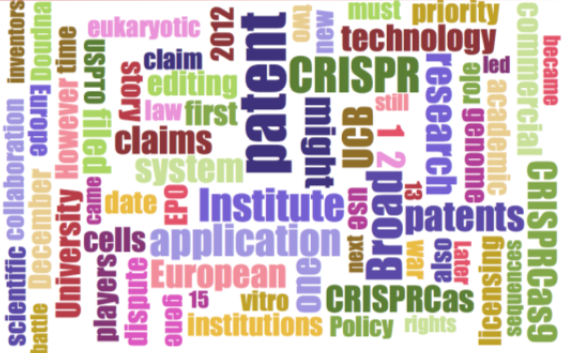 Two principal players weighed in to define the CRISPR/Cas9 patent landscape in the US: the University of California Berkeley (UCB) and the Broad Institute, a joint MIT-Harvard research institute. This ultimately led to a high-profile patent battle in front of the US Patent Trial and Appeal Board, where the Broad Institute prevailed in the first instance. The dispute, however, continues worldwide. In this Communication, I will focus on the European front of this litigation; the problem being not only who owns this technology in Europe, but also what are the potential impacts of patent conflicts between academic institutions on European policy and law.